We’re travelling back in time a bit to find one of the first true landscape photographers. Gustav Le Gray was originally a painter but moved over to photography very early in its incubation. His mastery of the craft and art of photography make him, for me at least, qualify him for this accolade. I think we can definitely say that between him and Fox Talbot, they made the first forays into representing the wilderness in photographic form. He is also one of the first proponents of HDR, although I think we can forgive him as he only shot two exposures and manually blended them. Take for example the photograph below. This would have been impossible to capture in one photograph for decades after his death and it was his vision of separating the sky and land components and mastery in combining them to artistic ends that is one part of the whole that makes his work so fascinating. Although apparently an incredibly clever inventor and self taught chemist (you had to make your own film in those days) Gustave wasn't the most talented of businessmen. He initially studied painting under Delaroche during which a detour to Rome - a common right of passage in that era - ended up with him meeting a young girl (rumour suggests this could have been a 'honey trap' by the girl’s parents), marrying her and returning to Paris months later. It is thought that he studied da Vinci's texts on the camera obscura when he was in Rome which would have piqued his interest in the burgeoning medium of photography. He very quickly became a teacher of photography to Parisienne luminaries (so photographers holding workshops for other photographers has a long history) such as Maxime Du Camp - a travelling partner to Flaubert who talked about Gustave in his diaries. He moved to the outskirts of Paris when two of his daughters died of cholera. The new location was to be his home for a decade and his first business card read "Photographic Printing House and Chemistry Laboratory", indicating the importance of craft to these first photographers. Gustave went on to write one of the first treaties on paper based photography (his early work and most other photographers were using the daguerrotype process). In common with quite a few photographers today, Gustave made a majority of his income from teaching other students, quite different to the majority who were trying to make money from portraiture. This separate income allowed him to pursue his own passions, in particular, that of photographing the forest at Fontainbleau. One of his goals at the time was to use photography as a form of simplification, allowing the Calotype process and the soft focus lenses of the time to blur a large proportion of the picture and hence to guide the eye to the main subject. 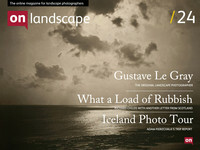 His landscape/forest photography looks quite contemporary even today. He was still a great portraitist(?) and for a long time one of his photographs was held up as an example of Nadar's (one of his students) best works until attribution was discovered leading to Gustave. The five years from 1855 to 1860 represent one of photography's golden ages. Stereoscopic photography was becoming popular and the carte de visite (a low cost way of getting multiple copies of portraits) had arrived by this point and all the world wanted portraits. Gustave, with the help of a substantial business loan of 100,000 Francs, set up a sumptuous studio in Paris which attracted a great deal of business. Although eventually a financial distaster, Gustave's working cash allowed him enough free time for his personal work back at Fontainbleua and between 1856 and 1858 he produced the epic seascapes that have made him so famous. For me, it is his work at Fontainbleau (read our article on The Forest de Fontainebleau) that stands out. He has a passion for that forest full of boulders that shines through in his photography. Working with large collodion glass plates he was able to record scenes in exquisite detail. His studies of individual trees from this period have attracted some of the greatest prices in present day auctions with one breaking records at the time with a final value of nearly half a million dollars. The end was nigh for this golden period and in 1860 when photography became commoditised and Le Gray's business was wound up. To add insult to injury his detested neighbour's photography business took over some of the space and his student Nadar eventually ran a successful business from it. As an escape, Gustave left on a tour with Alexander Dumas, http://en.wikipedia.org/wiki/Alexandre_Dumas (the author of The Count of Monte Christo and The Three Musketeers). This journey was an escape from family, debts and probably the friends that had abandoned him so cruelly. The Dumas trip was to be turned into a book covering the epic adventure "Voyage through Sicily and around the Meditteranean" illustrated by 2,000 Le Gray photographs. Sadly, Dumas became enamoured of Garibaldi and a woman and her pregnancy and Garibaldi's need for guns led to Dumas returning to France and thence back to Sicily. This left Le Gray and two others abandoned in Malta without any plan and without the future fame, the Dumas connection would have given him. Gustave bounced back and despite a few accidents and pitfalls, he ended up covering the Druze & Turks war/massacre of Maronites (a war influenced by the manipulations of the governments of France, England and Turkey) for Le Monde illustre, becoming effectively one of the first photojournalists. He moved on after a few months to Alexandria. He wasn't quite as successful nor had quite as romantic a career in Egypt (his final destination) where his first recorded commission was photographing camels with canons mounted to their backs** (recalling sharks with lasers - oops) which were being transported to Sudan to quell further Muslim revolts. Other commissions were occasionally forthcoming but were not enough to stop his decline into debt again. At the age of 62 he tried to remarry a Greek 19 year old with whom he had fathered a child. He was to die shortly after at the age of 64, only just having enough assets to pay his debts. Gustave's contributions to photography should not be underestimated. He was a photographic artist at a time when photography was considered more engineering or business. He was a chemist who invented, documented and taught cutting edge techniques. He arguably invented a form of the Collodion process (although Frederick Scott Archer has a claim to this and also invented the ambrotype process). It was his devotion to the landscape, particularly that of Fontainbleau, and his incredible seascapes that give him a significant place in the history of landscape photography. Most of this summary biography was sourced from the Excellent "Gustave Le Gray - 1820-1884" by the John Paul Getty museum (available from Beyond Words for £29.20 plus carriage) - a very enjoyable biography and summary of the photographic environment of the age. I've included photographs from a few pages of the book and can highly recommend it for those wanting to dig deeper into the history of photography. There is an exhibition at the V&A in London where you can see some of Gustave's work and the following web page is also very informative (thanks to David Baker, milouvision, for the link) ..